An Aéropostale store at Toronto Eaton Center in Toronto, Canada. The New York company said Wednesday that it is closing 113 of its 739 U.S. stores and all 41 locations in Canada. Aéropostale, once the vibrant epicenter of the U.S. mall scene, is seeking Chapter 11 bankruptcy protection. The New York company said Wednesday it will close 113 of its 739 U.S. stores and all 41 locations in Canada. Going-out-of-business sales at those U.S. stores will begin this weekend. In Canada, sales will begin during the week of May 9. 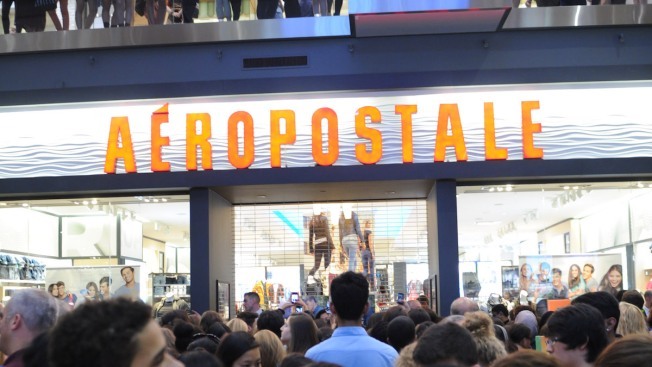 Aéropostale expects to emerge from bankruptcy protection within six months as a smaller company after renegotiating contracts and resolving an ongoing dispute with the investment firm Sycamore Partners, a major shareholder that pushed through changes in company leadership. "We appreciate the loyalty and support of our customers, employees and business partners as we complete this process," CEO Julian Geiger said in a statement posted on the company's website. Aéropostale says it has also filed a series of motions that, pending court approval, will allow the company to pay employee wages and benefits without interruption and honor all gift cards in full. The company's shares traded for more than $30 six years ago, when annual sales exceeded $2 billion. Two weeks ago, it was delisted from the New York Stock Exchange with shares having failed to break the $1 barrier since last year. Aéropostale's market capitalization by this week had fallen to around $14.4 million. Early this year, Aéropostale said it would cut expenses by $35 million to $40 million annually and trimmed its corporate staff by 13 percent, about 100 jobs. "Fast fashion" outfits like H&M and Forever 21, with more inexpensive clothes, have emerged in recent years to take a growing market share from former mall staples Aéropostale, Abercrombie & Fitch and American Eagle Outfitters. A complete list of stores closing is available here.